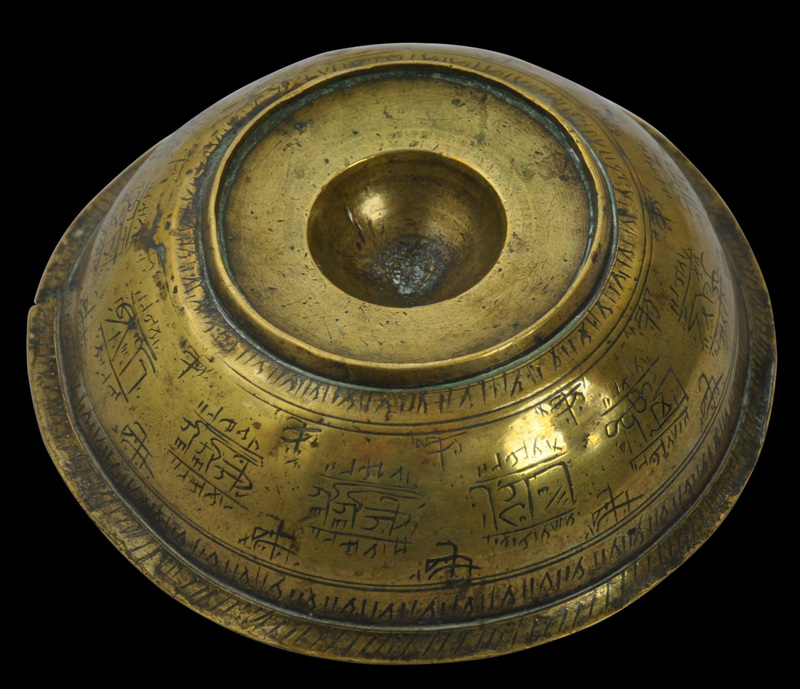 This ‘magic’ or medicinal bowl dates to eighteenth or nineteenth century and is either from northern India (where such bowls were known as a tawiz) or from Persia (Iran). Of engraved brass, it has a steep, hemi-spherical central boss. It has an engraved, everted rim, and a low ring foot. The central boss is surrounded by engraved bands of naskh script. The interior sides are engraved with more script within roundels, and mihrab-shaped cartouches. 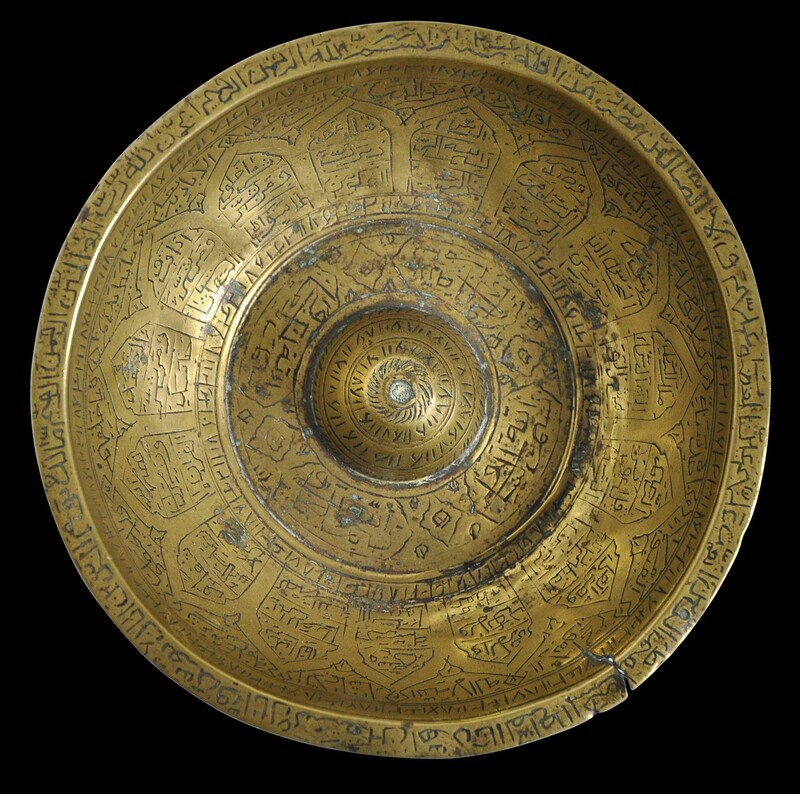 The rim is flat and engraved with a single line of script that runs right round the bowl. The exterior side is decorated with a series of fields of more script. Magic bowls did not offer continuous talismanic protection but were used only when needed. 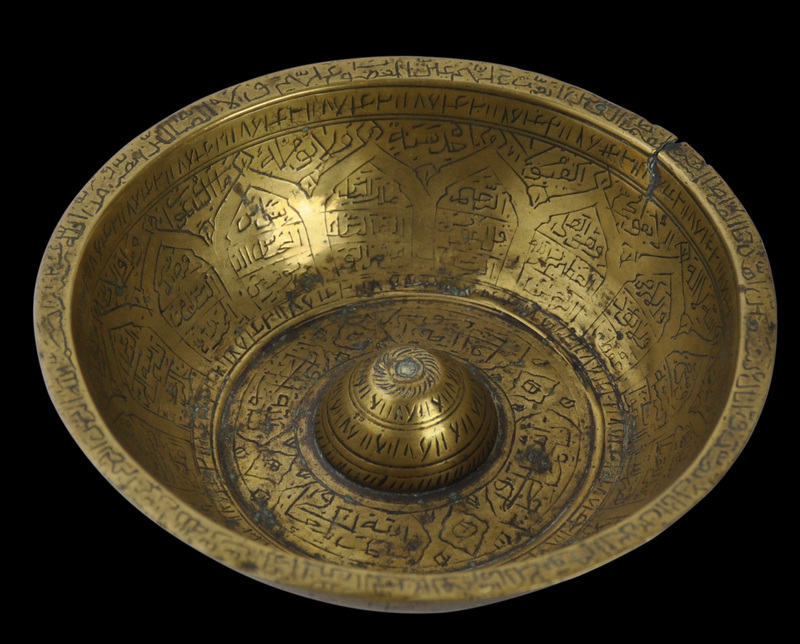 Liquid would be placed in the bowl and the Koranic verses and magical diagrams would imbue the liquid with curative and protective properties. An afflicted person would then drink the liquid in the hope of relief. The bowl here is in fine condition. It has a very good patina and obvious age. There is an old, small crack to the rim which runs a short way into the bowl. Bussabarger, R.F. & B. Dashew Robins, The Everyday Art of India, Dover, 1968. Maddison, F. & E. Savage-Smith, The Nasser D. Khalili Collection of Islamic Art: Science, Tools & Magic, Part One: Body and Spirit, Mapping the Universe, The Nour Foundation, 1997.